I’m off on a long bicycle ride tomorrow, which would be a really healthy thing to do… if it didn’t give me an excuse to bake and scoff hugely calorific things the night before. In fact I’m combining cake and biscuit (cookie), hence my new term: biscakes! 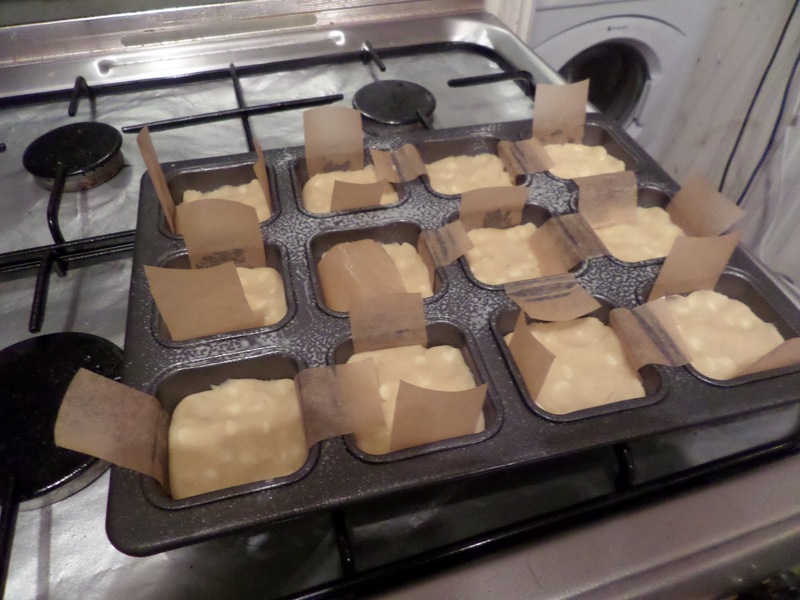 These are going to be a biscuit (cookie) base with a cake on top :) I’ll be cooking then in individual squares… because we’ve got a new tin that does individual squares than needs using. I’m going to go with a pretty basic shortbread recipe as I want a biscuit that isn’t going to want to spread much (as it’ll be confined by the tin) and that will have some crunch. Mix dry stuff, cream butter, sugar & vanilla, mix, stir in chocolate chips. Spray the tray with oil, put a parchment sling in each to make getting them out easier, and put biscuit dough layer in each hole. 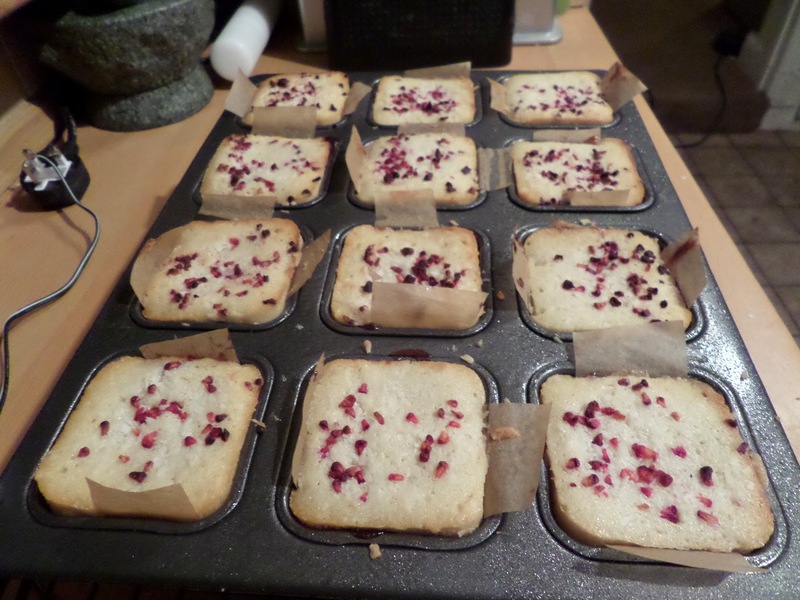 I didn’t use all the dough as ~50g per square would have taken up too much space in the tin and not left enough space for cake, so I went with 30g per square. These go in the fridge while I make the cake. For the cake part I don’t want something that’s going to rise too much, more tray bake than cupcake look, so I’m going to use plain flour without any leavener. Cream the sugar, butter and coconut oil, beat in the egg then coconut essence, fold in the flour, and add 1-2 tbsp milk to bring to dropping consistency. On top of each biscuit base I’ll add a layer of raspberry jam, then put a layer of the cake mix on top of the biscuit/jam base. 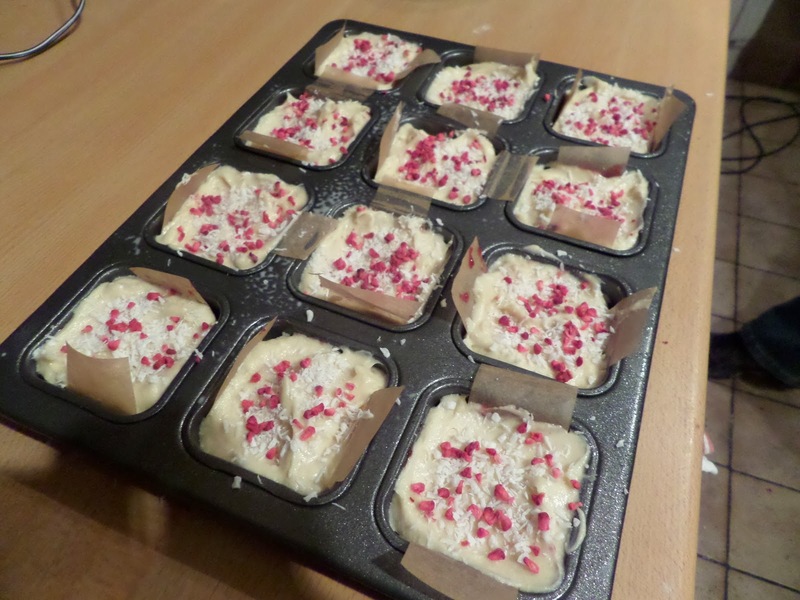 Top with desiccated coconut and raspberry sprinkles. Bake at 160C fan until a toothpick comes out dry: I’ll start checking at 15 minutes. I didn’t even open the door at 15 minutes, they’re clearly still wet. After another 5 minutes they looked good, and passed the toothpick test. While totally delicious… it’s basically just a cake. 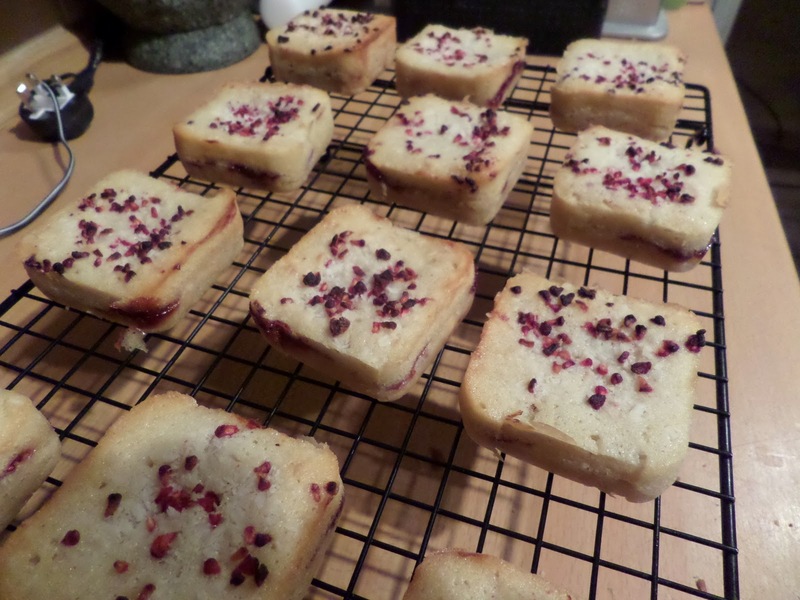 Maybe a bit bakewell-y, but they certainly don’t have a crispy biscuit base. Having discussed the problem with Soph, we think the solution is to blind bake the cookie part, as you would with pastry, to try and get the crispy base I’m looking for. Your new bis-cakes look good. Let us know if there’s an improvement when you cook the shortbread base first.